You'll be £14.99 closer to your next £10.00 credit when you purchase Luck of a Lancaster. What's this? No 9 Squadron of Bomber Command converted from the Wellington to the Lancaster in August 1942. W4964 was the seventieth Lanc to arrive on squadron, in mid April 1943. She flew her first op on the 20th, by which time No 9 had lost forty one of their Lancs to enemy action and another five had been transferred to other squadrons and lost by them. A further thirteen of the seventy would soon be lost by No 9. All of the remaining eleven would be damaged, repaired, transferred to other squadrons or training units, and lost to enemy action or crashes except for three which, in some kind of retirement, would last long enough to be scrapped after the war. Only one of the seventy achieved a century of ops or anything like it: W4964 WS-J. Across all squadrons and all the war, the average life of a Lancaster was 22.75 sorties, but rather less for the front-line squadrons going to Germany three and four times a week in 1943 and '44, which was when W4964 was flying her 107 sorties, all with No 9 Squadron and all from RAF Bardney. The first was Stettin (Szczecin in modern Poland), and thereafter she went wherever 9 Squadron went, to Berlin, the Ruhr, and most of the big ops of the time such as Peenemünde and Hamburg. She was given a special character as J-Johnny Walker, 'still going strong' and on September 15 1944, skippered by Flight Lieutenant James Douglas Melrose, her Tallboy special bomb was the only one to hit the battleship Tirpitz. During her career, well over two hundred airmen flew in J. None were killed while doing so, but ninety-six of them died in other aircraft. 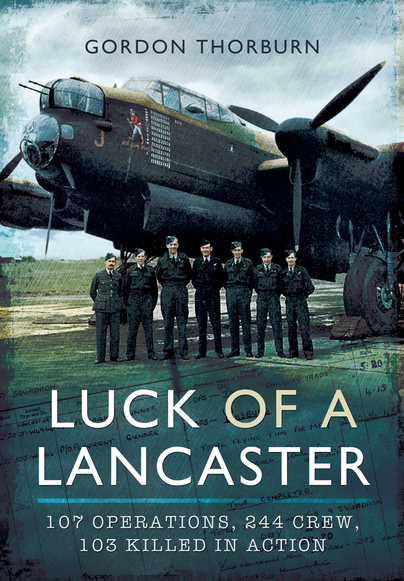 This is their story, and the story of one lucky Lancaster. An excellent book. ... Funny, thrilling, fascinating, shocking, sobering and above all, well written. Read this book. Apart from a huge range of bare facts and figures that could be read as a timetable of operations, Gordon also describes a lot of the action in such a way that the sheer magnitude of teh operations is made clear to the reader. Books such as this rarely come along, where the focus is as much on the aircraft as the air crews who flew it. It's a frightening and chilling account. While there have been many recent books on Bomber Command, this is certainly one of the best. I have read a lot of books on the later bombing campaigns of the war, but I have never read a better one than this. Book of the Month. Books such as this rarely come along. While there have been many recent books on Bomber Command, this is certainly one of the best. A detailed account of a faithful Second World War bomber. Gordon Thorburn is the author of the best-selling 'Men and Sheds'. For Remember When he has authored "Pocket Guide to Pubs and their Histories", 'The Classic Allotment' and 'The Classic Herb Garden'. Other books have included 'Cassius, the true story of a courageous police dog', and 'No Need To Die'; about American volunteers in RAF Bomber Command in WW2. Gordon lives in North Walsham, Norfolk.